Granola in a bowl with a spoon...and coconut milk. Granola in my hand...because I'm starving and want a snack. 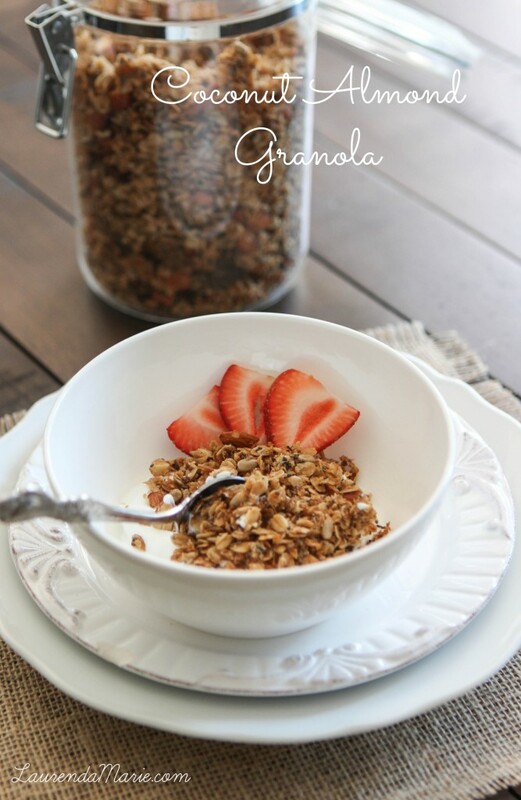 I'm not sure why I waited 8 months after the birth of my blog to post a granola recipe. Better late than never! This version is bursting with healthy fats and protein. It will keep you satiated without spiking your blood sugar levels. My favorite way to eat it is with a bit of plain Greek yogurt (sweetened with a bit of honey and stevia), and fresh berries! It's like THE perfect breakfast (or snacky snackerson). So I know you've been hearing crickets over on this here blog recently, and I apologize for that. Moving proved to be a greater task than I anticipated. The actual move was the easy part! Hard part? Unpacking and organizing the 5034 boxes of junk stuff we've accumulated over the years. Throw a baby and a job in the mix, and stuff just doesn't get done! Not very fast anyway. Well, the dust is finally starting to settle and life is becoming more routine in our new place (which we absolutely adore, by the way). Every night before bed I thank my lucky stars for the life I have. My health, my family, my friends, and my home. My heart is fulfilled. Alright, I didn't mean to start getting sappy. My point is that I'm back. I will likely be updating once a week for a while with the hopes of getting into a twice-a-week routine. Thanks everyone for your patience during the move! In a large bowl, combine oats, coconut, almonds, sunflower seeds, chia seeds, palm sugar, cinnamon, and salt. Mix until well combined. 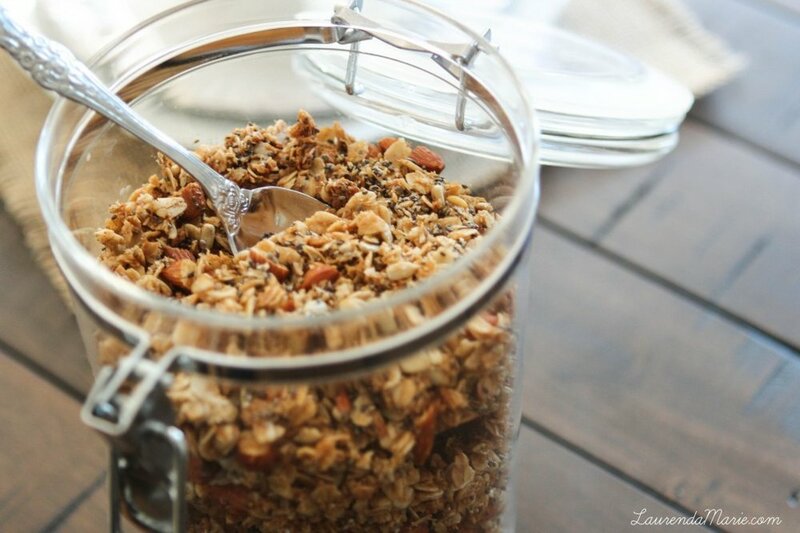 I baked my granola for an extra 5 minutes to give it a little extra crunch! [br][br]**Make sure to let cool completely before storing! If you don't, your deliciously crispy granola will turn into a soggy mess. Boo! This recipe was adapted from two peas & their pod.